Japanese restaurants in America often feature sushi or meats cooked teppanyaki-style, with the chefs putting on a show. While these foods are certainly popular in Japan, there are many other foods that are more popular. 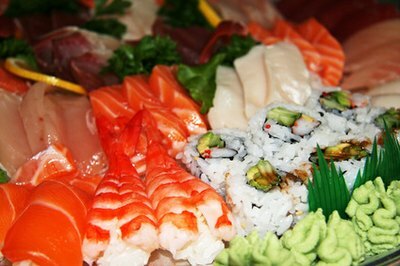 In fact, sushi is usually reserved for special occasions—most Japanese people do not eat it very often. The top 10 most popular foods in Japan are common throughout the country and widely available in many restaurants. 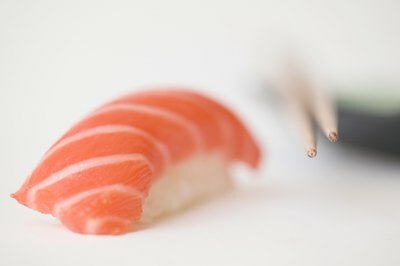 Sushi is just one of the many foods that are most popular in Japan. In America, ramen is often a meal that appeals to people only for its low cost. However, it is an extremely popular food in Japan. Ramen restaurants serve ramen topped with meats and vegetables for a healthy meal. 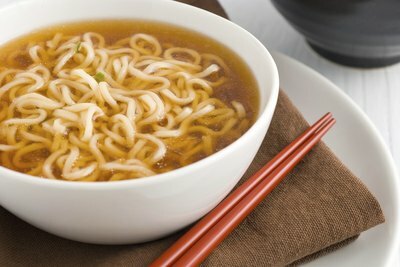 The type of broth used in ramen soup varies by region, with soy sauce-, miso- and salt-based broths being the most popular. In addition to ramen restaurants, you can also purchase cup ramen in most convenience stores, which also provide free hot water for a meal on-the-go. Donburi is the Japanese name for a rice bowl. It starts with a simple bowl of rice to which you add cooked meats and vegetables on top. One version of donburi is called "oyako-don," which features chicken (parent or "oya") and egg (child or "ko"). You can also top the rice with beef and onions (gyudon), tempura or fried pork (tonkatsu). Sushi consists of thin slices of raw fish served with rice mixed with vinegar. In some cases, the fish is served lying on top of small rectangles of rice, while in others it is rolled into a tubular shape with seaweed, then cut into circles. You can also find sushi made with vegetables and egg, as well as cooked fish. Onigiri is a popular lunch box dish in Japan and is widely available in convenience stores when you need a quick meal. 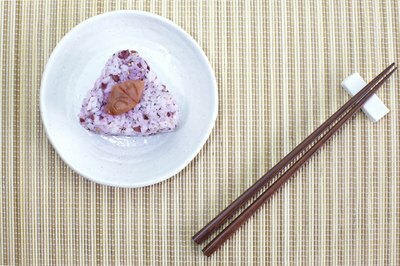 Onigiri consists of a ball of rice with a small bit of fish or plum in the center. The whole thing is then wrapped in seaweed. Traditionally, onigiri is shaped into a triangle and filled with salmon or tuna. 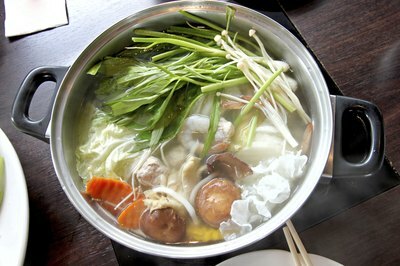 Nabe consists of a large pot of meat and vegetables boiled in a broth. Some convenience stores sell oden, which is a nabe with a soy sauce-based broth. Sukiyaki, shabu shabu and chanko are other forms of nabe. 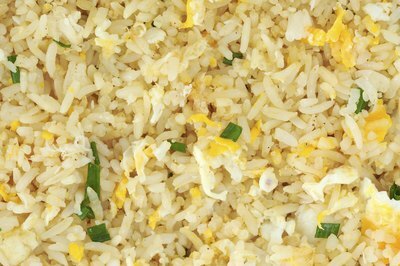 Chahan is fried rice and comes with many different ingredients. Typically, chahan includes rice, onion and egg fried with a dash of soy sauce. However, you can also purchase chahan flavor packets in Japan, which allow you to make fried rice with different flavors, such as shrimp or salmon. 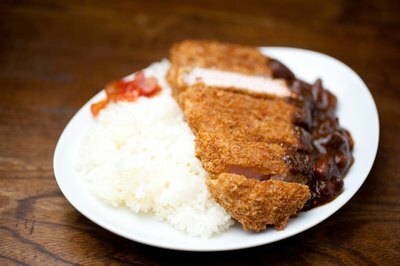 Though not a native flavor for Japan, curry rice is still a popular dish. Japanese curry is somewhat sweeter than Indian curry. It features vegetables and meats soaked in a thick curry sauce, which is then served over rice. Don't confuse this with "dry curry," which is the Japanese name for fried rice made with curry powder. Tempura is vegetables and seafoods dipped into a batter and then fried. Tempura is typically served with a tempura sauce made of soy sauce, mirin, sugar and fish stock. 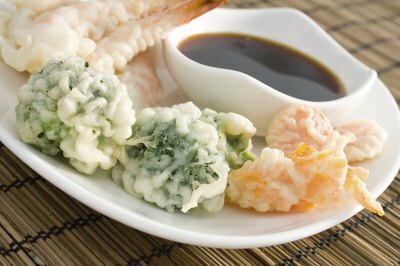 Shrimp tempura is the most popular seafood tempura. Vegetable tempura may consist of green peppers, potatoes, onions or bamboo. "Yaki" is the Japanese word for grilled. 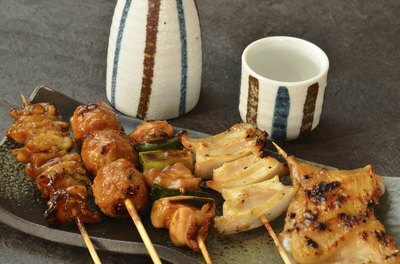 Yakiniku, is grilled chicken that is usually skewered before it is grilled. You can eat it off of the stick at yakiniku restaurants or at outdoor festivals. Yakizakana, or grilled fish, is a popular dish in Japanese homes—the typical Japanese stove does not have a full oven, but does have a small area where you can grill fish. Udon is a thick, flour-based noodle served in a fish broth along with seaweed, other vegetables and fish cake.